A fiber ribbon made by laying a group of primary coated fibers in parallel and cladding them with UV-curable resin. Since each fiber ribbon can be fusion-spliced as a unit, fiber ribbon splice time is saved substantially compared with single fiber. If you try removing the ribbon matrix of the optical fiber ribbon in the midst of its length, the probability is that you could break the fiber or damage the coating of the fiber. Or should you succeed taking individual fibers successfully, it would take several minutes accompanied by the unbearable uneasiness during the process. 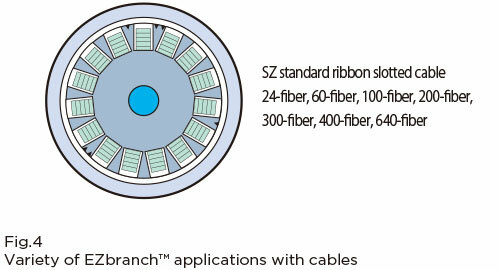 However, with our "EZbranch™" optical ribbon, a single fiber of optical fiber ribbon can be easily separated by gently snapping and pulling on the optical fiber ribbon using our exclusive tool due to its unique structure with deliberately designed depressions between fibers. The separation can be done in 30 to 40 seconds with no danger of open circuits. 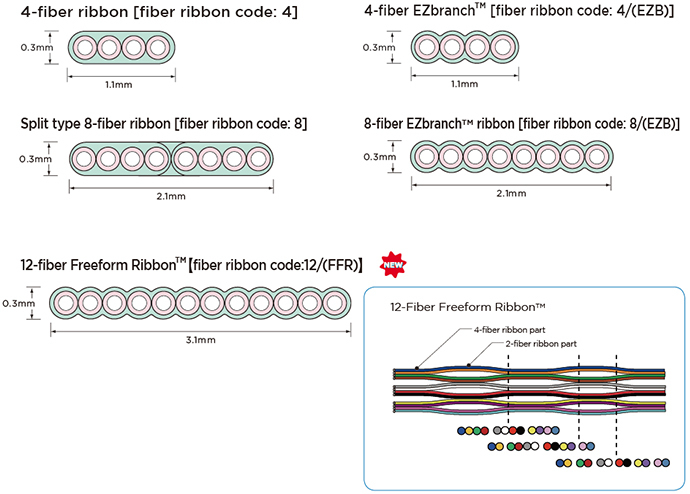 "EZbranch™" optical fiber ribbon conforms to standard specifications for optical fiber ribbon, and connection is compatible with conventional optical fiber ribbon; wiring parts such as cabinets and closures for conventional optical fiber ribbon can be used as is. 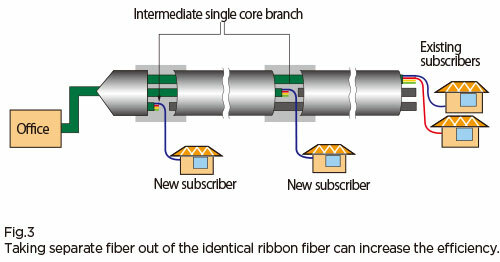 Any unused fiber in the optical fiber ribbon can be separated and connected to form an intermediate single core branch for a new subscriber, without cutting any passing single fiber ribbon, eliminating any waste of the fiber. We have the cable product range with “EZbranch™” ribbon fiber as we have them with the conventional fiber ribbon. And thanks to the thin ribbon matrix, the fiber ribbon experience lower PMD in EZbranch™ statistically than that of the conventional ribbon. EZbranch™ exercise its performance best with the bending insensitive fiber "PureAccess®" in FTTx applications. Drop/Indoor cable with PureAccess® EZbranch™ ribbon will give you new opportunities of wiring the optical fiber into the premises.